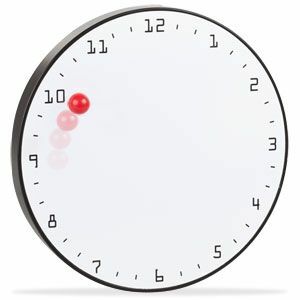 We’re always fond of slightly useless clocks here, so naturally we love this one, which replaces the conventional old two hands on a clockface with a small red ball. There isa hand on the clock, but it’s behind the face – nice hey. It has a magnet in it, which holds the magnetised ball in place as it swings round the face of the clock and traces the hour of the day. Sure you’re not going to know exactly what time it is. Your guess will be give or take 10 minutes, but that’s what your mobile phone is for eh? This minimalist beauty can go on the kitchen wall.